I Was Born To Cook: A giveaway to celebrate my 100th post! A giveaway to celebrate my 100th post! I'm having a blast with this blog and I hope you're enjoying it, too. I love hearing comments from all of you regarding what you like, don't like, how I've inspired you, what you'd like to see more of...any input has been helpful and appreciated. 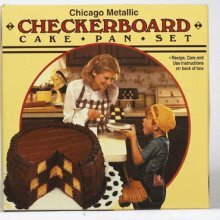 Here's a link for more information about this great checkerboard cake set! Perfect for special occasions and super easy to use. Leave a comment under this post telling me what type of cake you'd request if I were baking one for you tomorrow. PLEASE leave an email address if there isn't one linked to your profile when you comment. Thank you! You have until 3PM EST on Monday, March 14th to enter. I'll announce the winner later that day. simple yellow cake with chocolate pudding middle & chocolate frosting. My favorite. I am such a simple girl when it comes to cake. I'd either want exactly what Lishie would ask for or an awesome black out cake! And I already follow you! I really want to win this giveaway!!! hmmm If you were going to make me a cake tomorrow, I'd want a red velvet cake with cannoli filling (chocolate chips in it of course)and a whipped cream frosting. Now I'm hungry! Well, that chocolate cake you made for your birthday looks like HEAVEN. But since I'm on ww, I guess I'd go with angel food with a nice fruit redux on it. Definitely a funfetti cake with funfetti frosting!!! A pistachio cake with pistachio pudding frosting. Yum! I'd ask for a vanilla butter cake with chocolate frosting. Yum! Growing up my favorite cake was German Chocolate Cake - yum! Either strawberry shortcake or red velvet cake-YUM! I'm a fan on FB as well. I would definitely request Cannoli Cake. Congrats on your 100th post and wishing you hundreds more . :)I'd also go with a Cannoli cake as well. Delicious....Another NJ girl. Don't have facebook but I'm a GFC follower under Lucky47. a Pound Cake..I know it's a simple one, but my favorite. Served with fresh strawberries, yum! My id above showed up weird but it's Rob L.
I would love a Boston Cream Pie (that is really a cake, not a pie). Fav cake - Chocolate chocolate and more chocolate! I'm a fan! Don't know why my id doesn't show up properly, but I'm the one that would love a Boston Cream Pie. Oh It would be a White cake filled with a Cream Cheese filling! Your new dinnertime best friend.